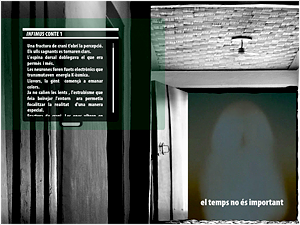 The Catalan-language La casa sota el temps presents an interactive reading environment with the look of a videogame. The reader begins by answering questions that will lead her towards the entry of the virtual world; in order to get to this "house under time," she needs to perceive the close relation between cause and effect. The reader is encouraged to treat literary clues as navigational clues, as instructions for how to move within the text. Using the Google Maps API to situate the house, La casa sota el temps aims to be an enquiry into the narrative potentialities afforded by software and computing resources (e.g. kinetic images, sounds, and verbal texts). Author description: La casa sota el temps ('the house under time') is designed and programmed to immerse the reader in a virtual space. It plays off of the structure of conventional narrative in order to create a reading experience that includes a multitude of interactive possibilities. The reader is the main protagonist of a multimedia journey that gives her the freedom to explore and also to build the fictional universe that she desires. Instructions: Click on the banner to open new window. Flash required. Previous publication: La casa sota el temps was the winner of the Vicent Ferrer award of best Catalan Work, "Ciutat de Vinaròs Digital Literature Awards," 2007.